This series started out fairly strong, with an air of mystery and romance. I was pleased with the general direction of the storytelling, but by the end of the final episode I was left wholly unfulfilled. Too many things were left unanswered, and it seemed overall as if they were building a story meant to last a few seasons, that only was approved for a single season. 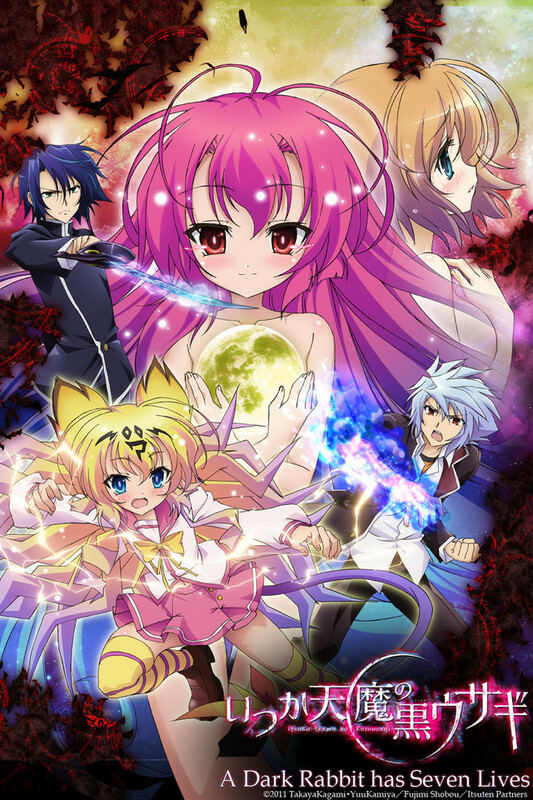 If you like flashy shows, with a bunch of fan service but not much else, this is for you. If that isn't your gig, move along. Better than you would think! At first glance, I thought this anime was going to be the run of the mill fan-service magical anime. While there is plenty of fan-service and ero content (especially the midway markers XD) there is also a good story and great art behind this series. I was happily proved wrong. The story focuses on quite a few factors (Ranging from love triangle to vampires, to witches and magic to even resurrecting the dead) and not just one in particular and it's an original story line too which is refreshing. The creators of this anime did a great job. Another cool thing about this anime is the ED's, there are 4-5 different ending themes they use for different episodes, I thought that was pretty neat. The previews are cute too, they have lil chibi characters doing stuff that is unrelated to the talking part of the preview but they are fun. I HIGHLY recommend it to fans of magic & fan service type anime. Nothing about this anime really stands out. The art is ok, story starts cool but turns generic, character development feels gross and fake, etc etc. Now let's talk about the ending. I didn't know that I was watching the final episode until it was over...and now that I know it was the ending...wow...terrible ending. The wrap-up they did for this short anime is ridiculously bad. There's nothing worse than wasted potential. I love vampires. I love kooky antics. I love dumb fanservice if it's incidental to the story. I was ready to love this series, only to be let down by how absolutely hollow it was. Stock characters who have no motivation, plot that never gets explained, and fights with no stakes or purpose are all you'll get in ADRhSL. Great animation, great sound, just a pity all that talent got drained into something so pointless and empty. The thing that came to mind when watching this anime was that I've seen a lot of aspects of this story before it wasn't very original. The main male character supposedly gets the power to protect his vampire girlfriend in the middle of this series then never uses it amongst other things that didn't seem to work and a bunch of unanswered questions writing was inconsistent. The animation was pretty good as was most of the action I didn't care much for the soundtrack either and like a lot of anime's their wasn't a satisfactory ending. It does have a bit of fan service both teaser and real due to some censoring I noticed in a few episodes. It's not totally bad just didn't seem to hit all the right buttons and really getting tired of unfinished anime's. Had nice opening and ending themes. Though the themes are misleading as it shows characters only in one to two episodes like they play a big part. Uhh, what is happening? There is no story development at all and no real explanation either. It is very confusing. Cute girls and guys are a plus but the lines are strange on certain objects and the backgrounds are not very fleshed out. The girls are annoying as hell. So wimpish and the guys are bleh as well. Really the only thing going for them is looks. Which isn't much. It is alright... It has a whole lot of plot developing points, but absolutely never builds up the plot past the surface level. It looked great, but at the last episode (12 atm) I could only make it through the first 6 minutes because it was poorly executed, and only served to make 'tension'. If there had been any real tension built up, I would rate this higher, but it feels like a QoL anime without any of the good parts of a QoL anime. It seemed like it was going to be really good at first with the main character being able to come back to life. Buuuuut as I kept watching it felt like it wasn't going anywhere and the main character seemed like this huge idiot who just kept getting killed.Gekkou also started too annoy me with his horrible attitude. I wouldn't say it was the worst anime I ever watched but it differently wasn't the best.